On APRIL 23rd, 2019 at 17:19:07 hr. 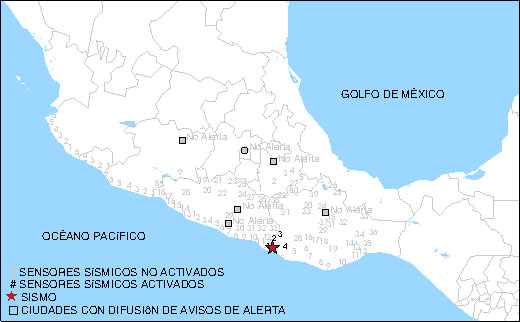 (local time) Seismic Alert System of Mexico (SASMEX®) has detected an earthquake No Notice broadcast to Mexico City. Preventive Alert on 29th JANUARY 2019 at 19:46:46 hrs. (local time). The Mexico City Accelerographic Network (RACM), registered the earthquake on 2019-04-22 at 15:15:23 of magnitude 5.5 sensed in the city. It is a radio receptor which provides alerts for a range of possible risks with different rapid response functions including the official sound of the Seismic Alert System of Mexico. Is able to record the effect of strong earthquakes at selected points in the structures of buildings. "Puebla Capital integrates into SASMEX® (ó Seismic Alert System of Mexico) and takes the lead within the country"
"30 Years after 1985 Mexico Earthquake"
814 Anaxagoras Street, Narvarte. C.P.03020. Mexico, City.